The Verdict: It had been a couple of disappointing weeks in the land of Parma however I went to the Morrison Hotel with very high hopes of the metaphorical tide turning and a good Parma being presented. Unfortunately I was again disappointed. From the cubed ham, to the very limited amount of cheese and sauce this was a disappointing effort from a much hyped venue. Chicken: The chicken piece in the Morrison Hotel Parma was this meal’s hero. It was well cooked and a substantial piece that tasted great. Tomato Sauce: I actually really enjoyed the tomato sauce on this dish there just was not enough of it. It did not cover the chicken piece and I ended up eating a fair portion of the chicken piece without any sauce at all. Ham: I have not seen cubed ham on a chicken parmigiana before and I hope to never see it again. To be honest I could barely taste it because, frankly, there was so little on the plate. Cheese: The photo of this week’s parma speaks all I really need to say about the cheese to be honest. There was just not enough of it. It did not cover the chicken piece and, again, I ate a fair portion of the chicken without any cheese at all. Side Dishes: Oh dear! Whilst the chips with this chicken parmigiana were pretty good the salad was, in a word, ordinary. It seemed to be put together as an after thought with pieces of onion, which normally I would applaud, strung over the salad almost like a garnish. It was bland and under dressed. Presentation: The presentation of this chicken parmigiana was spot on. The Venue: The Morrison is walking distance to the ‘Gabba and that fact is one of its biggest selling points. Add to that a very good steak in the restaurant and the Morrison is, without question, one of Brisbane’s most popular pubs. My parma cost $23.90. The Final Word: Whilst the Morrison possesses some of the best steaks in Brisbane it does not have Brisbane’s Best Parma. The elements were certainly there however this parma was just not put together well enough or with enough of the elements to make for happy eating. 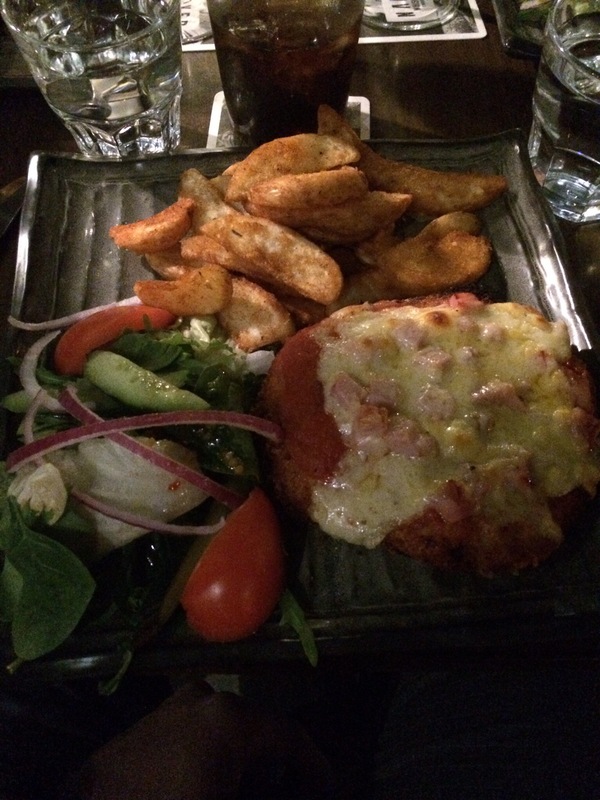 This entry was posted in Uncategorized and tagged Brisbane, brisbane's best, chicken parmigiana, Morrison Hotel, Parma. Bookmark the permalink. My god, man! Who threw up on your schnitzel? !